Stephanie Davis has confessed to fans that she is giving up alcohol, after realising that drinking ‘ruins her life’. This comes soon after fans were dismayed at a tweet posted late on Wednesday (3rd May) that was nearly completely illegible, but suggested at ‘cheating’ by her boyfriend Jeremy McConnell. Though she soon deleted the confusing message, worries about her state remained – and now she’s admitted to having issues with drinking alcohol. After Jeremy’s recent stint in rehab, he and Steph have gone on a romantic getaway to fix their relationship. However, it seems as if she’s come to an epiphany about her alcohol intake – and has shared her feelings in an honest letter to fans. ‘Honest note from myself,’ she begins the emotional note. The former Hollyoaks actress claims that neither she, nor Jeremy, would be drinking again, claiming that a ‘chemical imbalance’ makes her unable to enjoy alcohol casually in her life. ‘Me and Jeremy can’t drink. And won’t be drinking again. It’s been hard for me to admit and accept. ‘I’m a good mother and a good person but alcohol doesn’t agree with my life. It’s a chemical imbalance. ‘I hate that my life is in the media, but I can’t lie and keep this in,’ she continues. She ends her letter by reinforcing that she’s putting her family, Jeremy, and their son Caben-Albi, first: ‘I hope one day I can help people in the same situation. Your not a bad person your just powerless (sic). ‘I’ve hurt those that are close to me who I love so much. I want a happy future. For me and my family. It’s not nice to see. I love Jeremy and my son. Stephanie, 24, was fired from Hollyoaks in 2015 for after she was deemed ‘unfit to work’ when she turn up to set under the influence of alcohol. ‘Jeremy has done me so proud in rehab. I feel sorry for the papers that put us in the press every day. How about letting people live our lives. 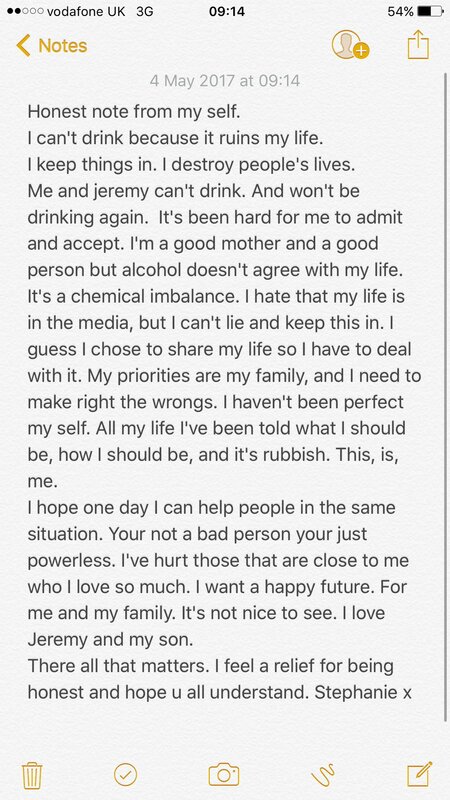 Now Jeremy has sensationally hit back at his on-off girlfriend’s revelation and made it clear that he’s NOT happy about speculation that he too might have been drinking again. The Irish model left rehab just a matter of days ago and is adamant that he’s not had a drop of booze since. Instead he claims that Steph was the only one drinking on Wednesday night. Since this all kicked off Jez has once again unfollowed Steph on social media. We hope Stephanie and Jeremy find the peace they need – but if they only kept their life away from the public, we imagine it’d be easier for the public not to comment.